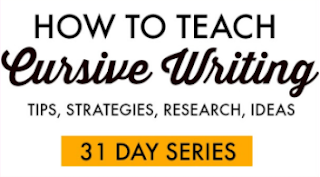 I kind of love to share tricks for improving handwriting. There are so many "parts" to written work. 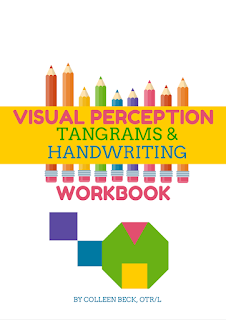 There's fine motor dexterity, pencil grasp, strength, endurance, visual perceptual skills, cognitive skills among other parts to handwriting. 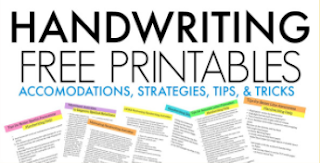 You can see more about these topics on our Handwriting page. 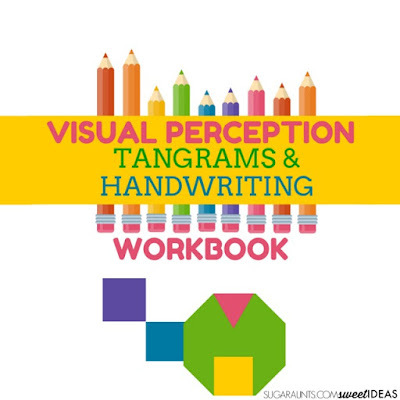 One big way to develop the skills needed in written work is to address visual perception. Kids love to play. It's in their soul. Play is the primary occupation of a child and so it only makes sense to work on functional skills like handwriting though play. Practicing writing over and over again sounds pretty boring to me and I can bet that any kiddo will agree. 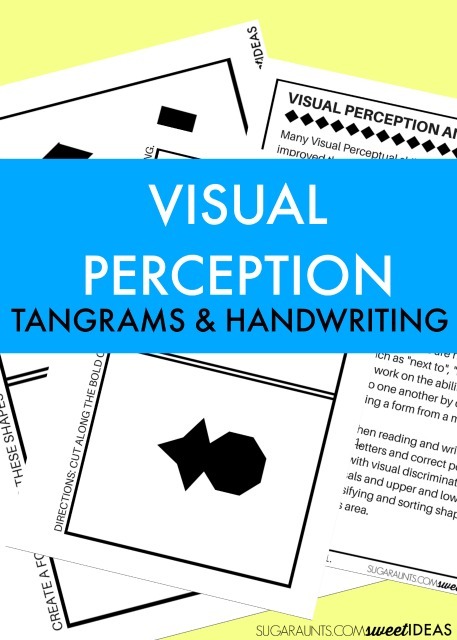 Today's activities are designed to work on the visual perceptual skills needed for handwriting using tangrams. 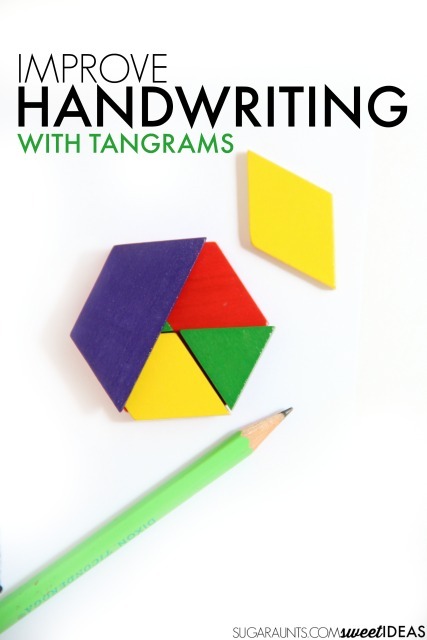 Get ready to play and build your way to neater handwriting! 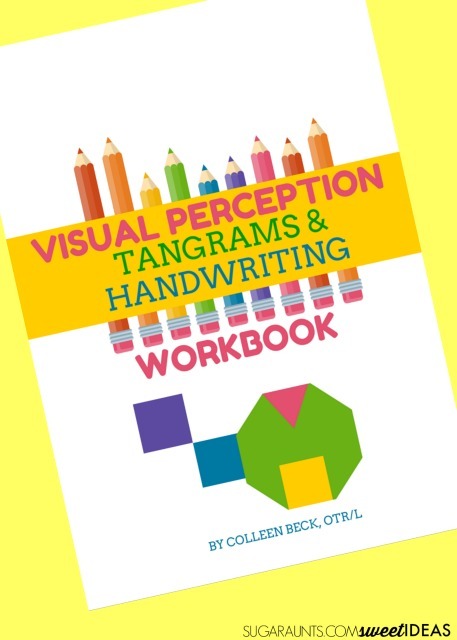 If you're looking for fun ways to work on handwriting, these activities are the way to go. 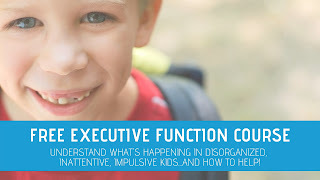 I've come up with creative puzzles, drawing activities, and building challenges that will work on all of the skills needed for improving line awareness, letter formation, and neatness in written work. Our Melissa and Dough tangram set is used a lot in our house. It's a great open-ended toy that doubles as a therapy tool for building skills such as eye-hand coordination. 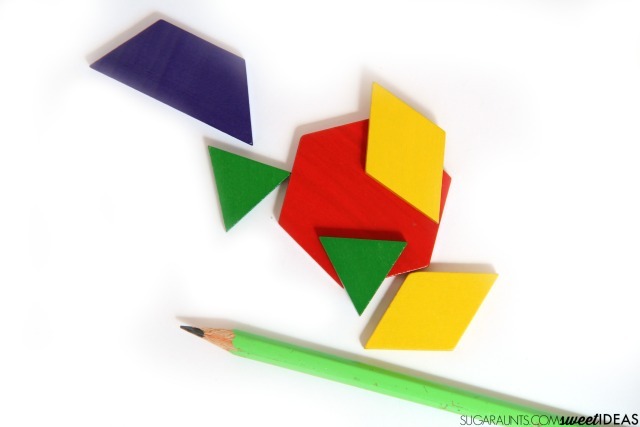 RELATED IDEA: Try DIY Sponge Tangrams for these hands-on learning activities. We created these file folder activities using the tangrams and came up with activities that will work on all of the areas of written work. Building skills like Position in Space and Visual Discrimination are important when it comes to improving neatness in written work. We printed off some worksheets and attached them to a file folder with paper clips. 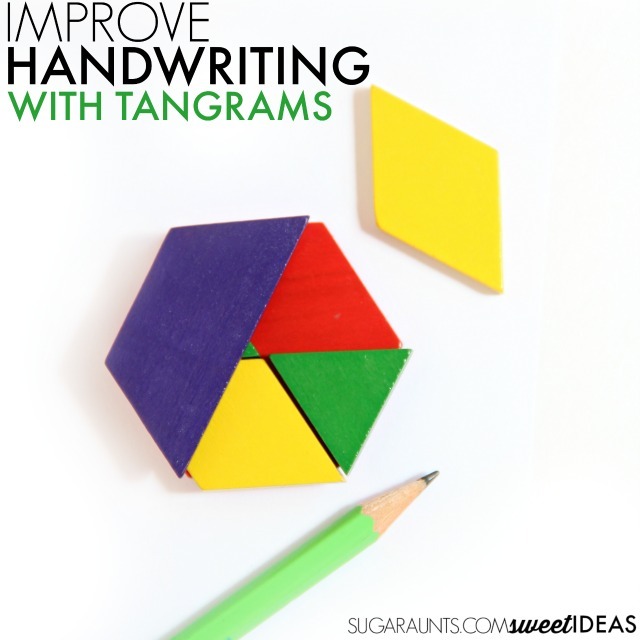 I set out the tangram shapes and showed my kindergartner and preschooler how to copy the forms. While they built shapes, they were developing and refining skills like Eye-Hand Coordination and Sequential Memory. We set up a few different activities using the file folder station. 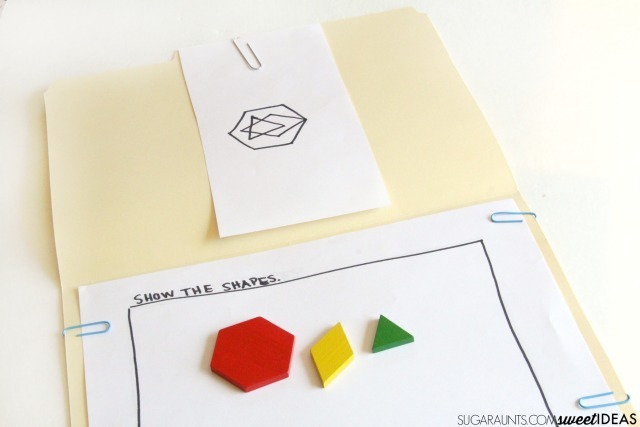 It's a nice activities because all of the pages can be attached to the same file folder using the paper clips. 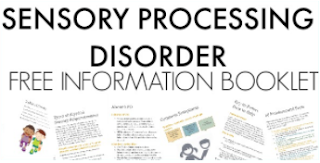 The pages can be rotated out and more complex sheets added in. 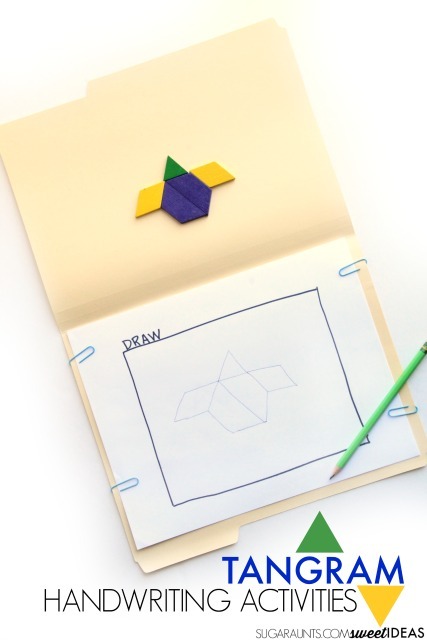 When you're done, simply close the file folder and slip it away with the tangram box to play another day. Want to grab your copy of the Visual Perception, Tangrams, & and Handwriting Workbook? It's available in our Shop for $6. Love this idea? Share it on Facebook.